iB Food are leading UK suppliers and wholesalers of ambient pre-cooked meats for chefs, restaurants, catering and the whole food service sector. Our aim is to help the caterer recreate the exciting flavours of authentic Italian and Mediterranean cuisine to a consistent quality using the minimum of labour and time. iB Food’s range of speciality meat dishes are made by traditional methods using authentic recipes from the Emilia Romagna region of northern Italy. With ambient storage and a shelf life of 18 months, it’s no surprise that iB Food’s Stincotto pre-cooked shanks have become the key feature on many pub, hotel and restaurant menus. Busy chefs appreciate the speed at which they can be prepared and customers love the melt in the mouth taste and fantastic aroma. Pork & duck stincotto are available, all ready to serve in minutes and with an average portion size of more than 300g, provides a very generous meal for one (average weight of whole Pork Stincotto is 600g). 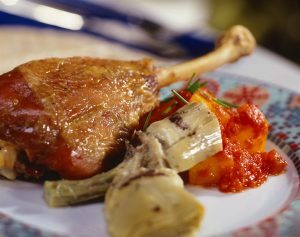 The meat is packed full of flavour and is so tender that it falls off the bone. Delicious with fresh, seasonal vegetables, baby onions in balsamic vinegar, glazed with honey and mustard, finished with cognac and much, much more. Enjoy! Cotechino is an Italian speciality of the Modena region which dates back to the 16th century. 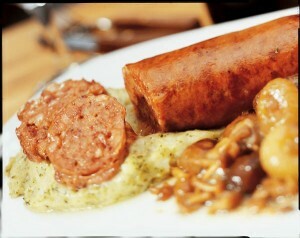 The dish is very flavoursome and contains minced pork meat presented in a big sausage style. Delicious with pesto mash and iB Food’s cocktail of wild mushrooms. 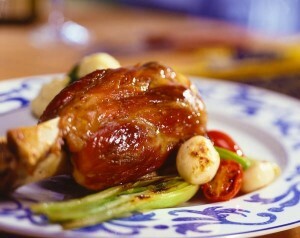 Stuffed pig’s trotters, or Zampone, are also a traditional Italian dish of the Modenese area. The trotters are filled with pork, herbs and spices to make an unusual and eye catching dish. 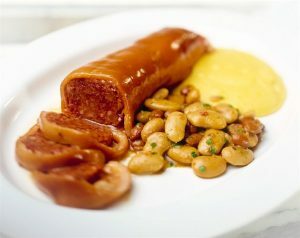 Ideal with iB Food’s Fagioloni and Lamon beans in tomato sauce for a real taste of the Mediterranean.